Polo Storico has done it again. Lamborghini’s internal restoration division presented its latest work at the classic car show Rétromobile in Paris, France last Wednesday: a 1972 Miura SV. The car has a pretty special owner, too: Jean Todt, current FIA president. Todt received his car on Wednesday at a special ceremony before it went on display at the car show and swap meet. The car was originally built in 1972 as chassis number 3673, which had previously been the number for a 1968 Miura S lost in a wreck. It wasn’t uncommon for sports car makers to use chassis numbers from previous cars during this era, mostly to save customers money on import taxes for new vehicles. 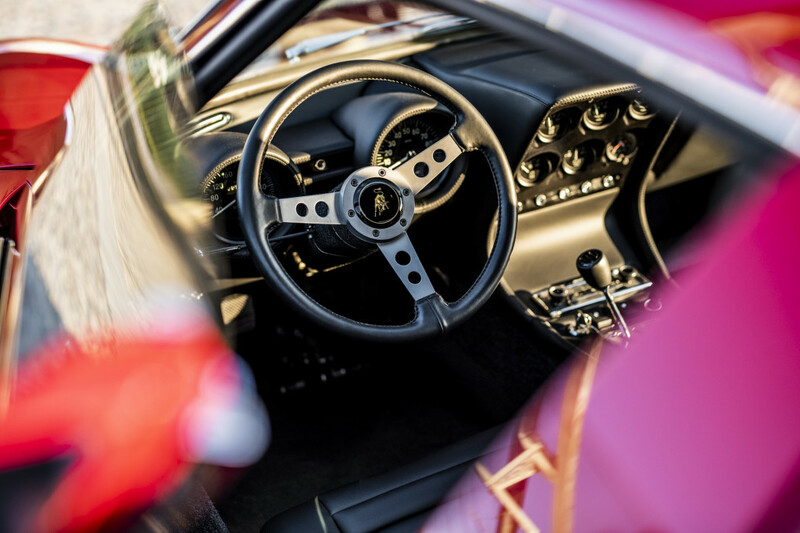 The Miura SV was delivered to its first owner in South Africa. It sported a red exterior with a lower gold band and a black leather interior. Today, it wears the same factory colors it did 47 years ago. When Todt brought it to Polo Storico for restoration, the firm said the car was in complete condition, but showed numerous signs of wear. The team disassembled the car, and in the firm’s typical fashion, worked to restore and refinish all of the original components rather than replace them. In the process, the firm also verified every detail right down to the markings on the frame. Polo Storico is only three years old, but the firm has already produced some incredible restorations, including another Miura to celebrate the car’s 50th birthday in 2016. It can handls the restoration and certification for every Lamborghini model produced up until 2001 and manages archives to reference for future restorations. Fans can see the Miura SV alongside a 1966 Lamborghini 400 GT that Polo Storico is busy restoring. The show runs through Feb. 10.